Devotees of the blog will doubtless know the esteem in which I hold the Manhattan, which is why we rather assiduously avoid frivolous knockoffs. Devotees, however, will also know my predilection for quirky and esoteric booze, hence the conflict. B & I wound up with a bottle of Torani Amer, a version of the original French Amer Picon that is currently unavailable, at least here in the States. 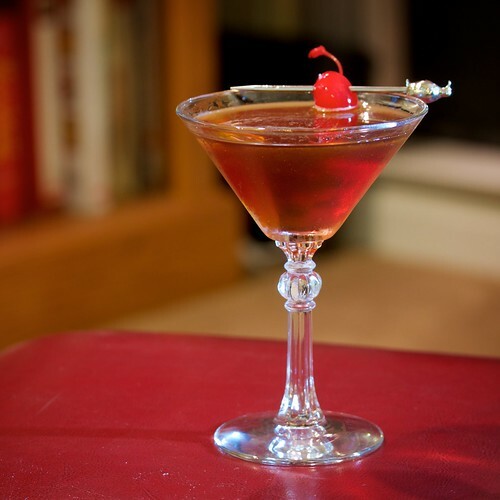 It’s a sufficiently worthy ingredient consider a Manhattan riff. Torani is a orange bitter liqueur that is a bit like Curaçao, but bitter rather than sweet. We found The Liberal in Ted Haigh‘s Vintage Cocktails and Forgotten Spirits, who appears to be rather enthusiastic about finding this cocktail, but a little vague on the history. He claims to have found it buried in a version of the Waldorf Astoria Bar Days from the early 1930’s. A bit of further searching turned up a post on Birth.Movies.Death. blog by Bill Norris who found a reference from 1895 in Modern American Drinks by Gabe Kapler. Well this is better. A bit of history and pedigree. His blog post has a number of version of the cocktail, including the one from 1895. In the end we decided to go with Robert Hess‘s version from The Essential Bartender’s Guide. Stir with ice and strain into a chilled cocktail glass. Garnish with a twist of orange. This is a really great (and entirely respectable) alternative to the classic Manhattan, a feat akin to covering the Rolling Stones–something most should really avoid attempting. The discovery of Torani Amer is also a very fortuitous find. Unfortunately, it apparently has a rather limited distribution, limited mostly to California.